Maria Sharapova returns to the court for the first time in nearly nine months when she makes her World TeamTennis Smash Hits debut on Monday, October 10, at 6:30 p.m. Pacific at Caesars Palace in Las Vegas. Sharapova, the popular global icon who burst onto the pro tennis scene at the age of 14, will be playing in the charity event for the first time in its 24-year history. 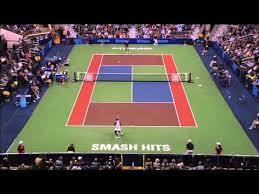 WTT Smash Hits, which is co-hosted by Sir Elton John and Billie Jean King, raises funds for the Elton John AIDS Foundation. Sharapova is the latest additions to a lineup that already includes John McEnroe, Martina Navratilova, Andy Roddick, Mardy Fish, Mark Philippoussis and Liezel Huber. Tickets for WTT Smash Hits are available through WTTSmashHits.com or axs.com, or by calling The Colosseum at Caesars Palace box office at (866) 320-9763 or AXS at (888) 929-7849. All seating will be reserved and have chairbacks. VIP seats, which include admission to the pre-match VIP Reception and Live Auction, are $545. For the tennis action only, Premium Reserved chairback seats are $136.25 and Reserved chairback seats are $59.95. For group sales of 10 or more tickets, call (212) 586-3444 x. 121. Ticket prices include Live Entertainment Tax as assessed by the state of Nevada. The evening begins with a pre-match VIP Reception and Auction at 5:00 p.m. at Caesars Palace with the match start set for 7 p.m. on a specially-constructed tennis court in the valet parking lot adjacent to Caesars Palace Drive. A limited number of special VIP ticket packages, including VIP courtside seating and admission to the VIP Reception and Auction, are available for $545. John, King and all players will participate in the pre-match live auction, which will include an Elton John signed piano bench and King’s Wimbledon tickets, among other items. Official event sponsors include host sponsor Caesars Palace. Additional sponsors and partners include AmerisourceBergen, Core Academy, DecoTurf, GEICO, Kilpatrick Townsend & Stockton LLP, Marty Hennessy Inspiring Children Foundation and Wilson. Ryan Wolfington and USTA Nevada are promotional partners of WTT Smash Hits. Sponsorship packages are also available by contacting Natalee Jarrett atnjarrett@wtt.com or (212) 586-3444 x. 111. For more information on the Elton John AIDS Foundation, visit EJAF.org.